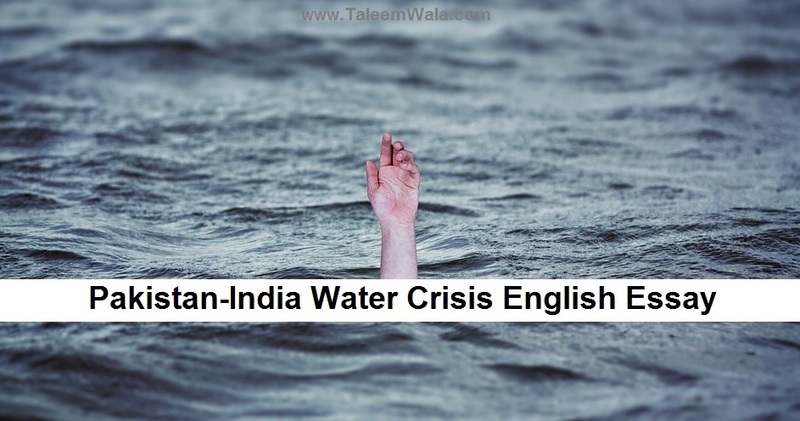 If you are looking for an essay on on Pakistan-India water crisis then read and download this English essay on water crisis between India and Pakistan so that you can prepare for your next test exams. 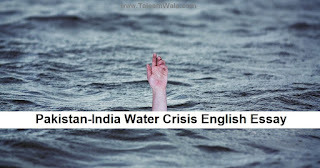 Question: Evaluate the significance of water conflict between India and Pakistan in global perspective of climate change. Climate of the earth has been continuously changing since the day of it's creation; however, the change has become quite drastic for past two or some centuries. This change has also created shortage and scarcity of some of the once abundant resources like water. Scarcity of water is a huge problem to many countries of the world, especially those which are developing. The effects of environmental degradation and poor management of available water resource have made water one of the scarcest resources in many poor economies. As a result, there is a struggle for this resource and this sometimes leads to conflicts. The India-Pakistan water conflict is an example of conflict arising from scarce resources. Growing scarcity of water resources, increasing population and poor management of water resource in India and Pakistan has resulted in an increasing demand for water resources. The increasing scarcity of water leads to the desire for control of water resources, which in turn becomes a ground for breeding conflicts. The need for water is accentuated by the fact that these countries are mainly agrarian economies. These conflicts have not only hampered their economic development at the national level, but the region, as a whole, is not fully benefiting from the process of globalization. However, the scarcity of water resources in some cases has been instrumental in developing cooperation among states. The Indus Waters Treaty between India and Pakistan is one of the few examples, of settlement of a major, international river basin conflict. However, the grievances of contracting parties, lead to the possibility that the present cooperation may turn into a future conflict. In the following lines, we shall focus on the India-Pakistan water dispute, with a comparative evaluation of past and future trends, followed by suggestions for sustainable future cooperation. In addition, implications of the disputes amongst these states and how cooperation can resolve the disputes will also be discussed. Recommendations on how t~is dispute can be resolved, including using mediation, dialogue, water conservation and others will also be briefly discussed. The water dispute between Pakistan and India began during the early J 960s. However, the Indus Treaty between the two countries created an understanding of how water between the two countries would be shared. Six rivers that is; the Chenab, Indus, Beas, Sutlej, Ravi and Jhelum flow to Pakistan from India. This treaty divided three rivers for use by each country. India had the Beas, Sutlej and Ravi and Pakistan had access to the Jhelum, Chenab and Indus. However, main obligation was of India because the sources of all rivers were in India (Occupied Jammu and Kashmir). India has tried to violate the agreement many times since 1960. Population growth is a major factor which puts pressure on resources. Population growth leads to the over utilization of resources, and in case these resources are scarce, the population needs are not met. In such circumstances, this may lead to the development of conflict. Water is a scarce resource in many countries.When population growth exhausts the available water resource or the growth rate does not match the increase in water resources, then population needs will not be met, leading to conflict. The population will be unable to acquire safe water for consumption and adequate water for agriculture, especially in agrarian economies. In such cases, political instability may occur as nations fight for their right to access a water resource. This conflict may begin at a local level and gradually escalate to a matter of international concern as in the case of Pakistan and India. The Pakistani population is increasing gradually and is set to reach 250 million within the next decade. This is a huge population which requires adequate water to sustain its livelihood. Weak treaties are another major source of international conflict. Sometimes, treaties are used when sharing resources to ensure all the parties acquire a reasonable stake in the resource. Treaties which are weak are those which may be ambiguous, those which do not anticipate future trends and those with loop holes among others.When one or more parties realize that the treaty does not favour them, they are likely to rescind their decision to follow the treaty. When the Indus treaty was made in 1960, adequate projections on the water needs of both countries, in decades to come, were not properly done. It was not decided whether both the countries would be allowed to construct dams on the rivers, and their repercussions to those relying on such rivers for agriculture. And as a result India has taken benefit of this ambiguity and it is constructing many dams on the rivers of Pakistan share. When many countries discover a resource, they exploit it until it gets depleted without understanding the consequences of depletion of the resource. Water resources are no exception, and unless they are conserved,they are likely to be depleted or used ineffectively. Many poor countries do not conserve water although it is a scarce resource. Such countries are unable to meet the population needs when these water resources dry up,• or have declining levels. Unfortunately, Pakistan loses millions of cubic meters of water daily due to lack of water conservation efforts. When such losses occur, the country is unable to satisfy its citizens' water demands.The inability to meet this need is blamed on other factors and this may create conflict between two or more nations. Climate change has had severe impacts on available resources. Environmental destruction has led to unpredictable and adverse weather conditions across the world. Such weather conditions include drought,floods, heat waves and others. In economies that heavily rely on agriculture, these conditions may cause heavy losses. When drought or winter occurs, and there is a limited water resource, this may lead to conflict over this resource especially if a nation has not taken enough water conservation measures. The latest dispute involving Pakistan and India relates to construction of a dam, and Pakistan argues that climate change will bring harsh winters, which will reduce the river flow as a consequence of diversion of the river by India. Leadership in any country entails the distribution of resources. All leaders should ensure that available resources are distributed and used for the welfare of the majority population in the nation. When there are good leaders, even scarce resources are effectively used and conserved to ensure that they satisfy the country's needs.However, in cases where the leadership is weak, the available resources are misused or used for the benefit of a few. This leads to wastage, and the majority population does not have access to such resources. In this case,conflict over the limited water resource is likely to occur. The dispute between India and Pakistan can be partly blamed for weak leadership which is hesitant in solving the issues present. The water capacity in Pakistan has been declining over the years and it poses a threat to the survival of its population within the next decade. Pakistan had water crisis during 2009 due to the reduction of its water capacity. In 2009 its water capacity was 1200 cubic meters while in 1950 it was 5000 cubic meters. This figures expected to reduce to 800 cubic meters over the next decade. Scientists warn that Pakistan will face a water disaster within the next three years if interventions to ensure availability of water are not implemented. As has been stated, there is a great concern that the construction of the Baglihar Dam will deprive Pakistan of water. Pakistan is of the opinion that further reduction in water capacity can be attributed to India's construction of the Baglihar Dam. Scientists explain that over 320,000 acre feet of water will be lost from the construction of this dam. This will adversely affect agricultural activities such as the production of wheat in the province of Punjab. In addition, irrigated land around Ravi and Chenab rivers is set to be adversely affected due to the reduced water capacity. Although some experts have claimed for a next war between Pakistan and India over water, the conflict can be resolved or at least minimized though taking some actions by both countries, especially by Pakistan. Water is one of the most important resources which India and Pakistan rely on in achieving· economic development. This is because both the countries rely on agrarian economies which form a large proportion of their GDPs. For these two countries to achieve greater economic prosperity, they should cooperate in implementing moves aimed at conserving the water resource. Since these rivers flow between Pakistan and India, it is necessary for both the countries to implement simultaneous actions aimed at conserving water and using it effectively to meet the needs of each country. Complex and may have been unforeseeable when developing the initial treaty. It is therefore necessary to alter the treaty to reflect the current concerns while safeguarding the interests of both countries. Since these rivers under consideration flow in both countries, it is clear that India and Pakistan are dependent on each other and neither can exist independently. Mediation is another successful strategy which may be used to end the conflicts between Pakistan and India.For mediation to be a success, it should involve a mediator who is neutral to the concerned parties. Both Pakistan and India should choose a leader who comes from a country which is neutral to both countries interests. The proceedings should be held at a neutral country or on a rotation between both countries. Both countries should choose representatives who will argue their case to the mediator. The mediator will then make decision on India's decision to build a dam, on the basis of evidence provided. The Pakistan-India water dispute has lasted for several decades but recently water scarcity due to climate change has intensified this dispute. This dispute is attributed to the Indus treaty made in the 1960s which set out how Pakistan and India would share water resources. One of the clauses was that India would not construct a dam in rivers which belonged to Pakistan without express permission from Pakistan. However, India flouted this rule by constructing a hydro-electric plant in Doda district along Chenab River without due consultation from Pakistan.Pakistan saw this as an economic and political threat since it depended on waters from this river for agricultural purposes. However, this conflict has adversely affected both the countries by limiting development through cooperation. It also poses a danger of encouraging terrorism between the two countries especially if terrorists find it a cause worthy of their intervention. This conflict may also degenerate into war, especially if a terrorist activity occurs as a result of the conflict or if leaders intentionally provoke each other in a bid to resolve the dispute. This may lead to a regional war and may cause many fatalities. Water conservation is an important policy which should be embraced by Pakistan and India to reduce expenses on water costs and prevent the depletion of the \vat er resource. These measures should be embraced by all countries with resources, since they will prevent future problems or conflicts which are associated with possession of resources.